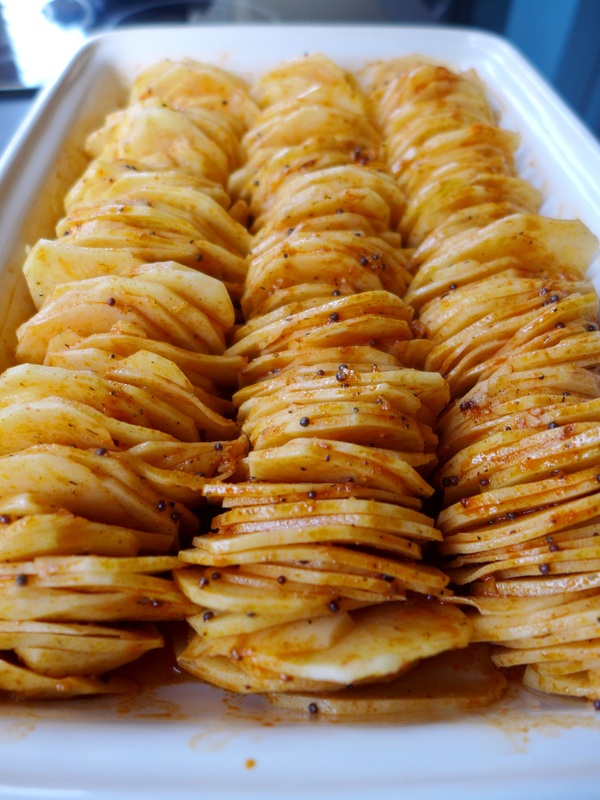 Not roasties, not hasselbacks, but stacked potatoes … crisp on the top, soft in the middle, they look sensational and the flavours will knock your socks off. We ate these with lamb raan but they’re a good way to spice up any meal, whether it’s a Sunday roast or a veggie feast. Unless you have the knife skills of a Samurai sword master, though, it really helps to have a mandoline. I was cooking for eight … scale back accordingly if you’re cooking for smaller numbers, but keep the punchy flavours and don’t skimp on the oil. Peel the potatoes and slice thinly (about 0.25 cm) on a mandoline, dropping the slices into a large bowl of cold water as you go. Once they’re all done, dry very thoroughly between two clean tea towels. If you don’t get them dry enough, they’ll leach moisture into the cooking dish and steam rather than roast. In another large bowl, whisk the chilli paste, spices, lemon zest and juice, salt and oil. Tip the potato slices into the bowl and mix – it’s easiest to get your hands in there – until every slice is coated. 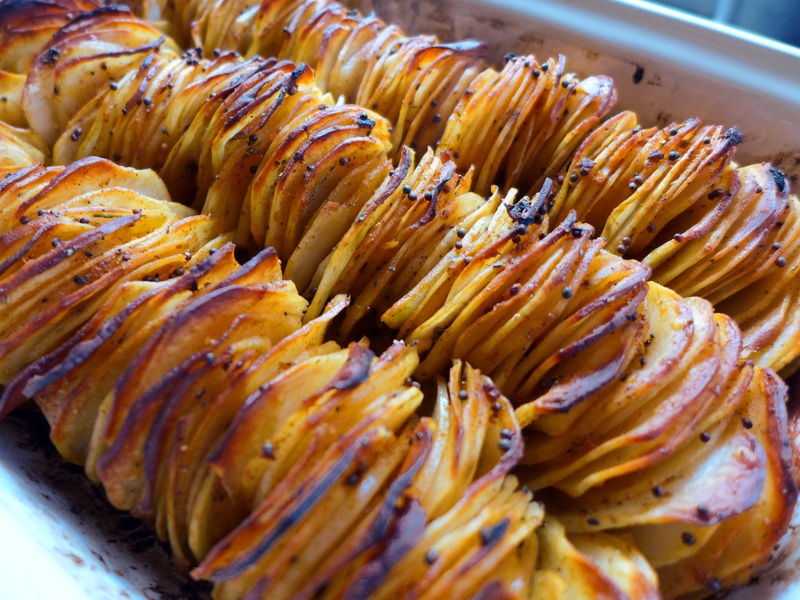 Take a baking dish of approximately 30cm x 20cm and stack the potatoes in rows the length of the dish, packing them in quite tightly so they stay upright. Drizzle over any of the chilli mixture left in the bowl and roast in the oven for 70-90 minutes, or until soft to the tip of a knife. Check halfway through and if they look too dry, drizzle with a little more oil. This entry was posted in Vegetables and salads, Vegetarian and tagged side dishes, spiced stacked potatoes, stacked roast potatoes, vegan, Vegetarian by Linda Duffin. Bookmark the permalink. This looks awesome…I can’t wait to try it!! + is it really essential to drop the spuds in water? I mean, if one works fast ecc… yes, there might be some discolouring but then one could thus avoid the drying step, which is important, as u say. In summer I make sth similar with pots and tomatoes and a garlicky oil (and then.. talking about stacking: the wonderful aubergine fans in Richard Olney’s Simpre French Food)…. Thank you, Margaret. Ours, too! 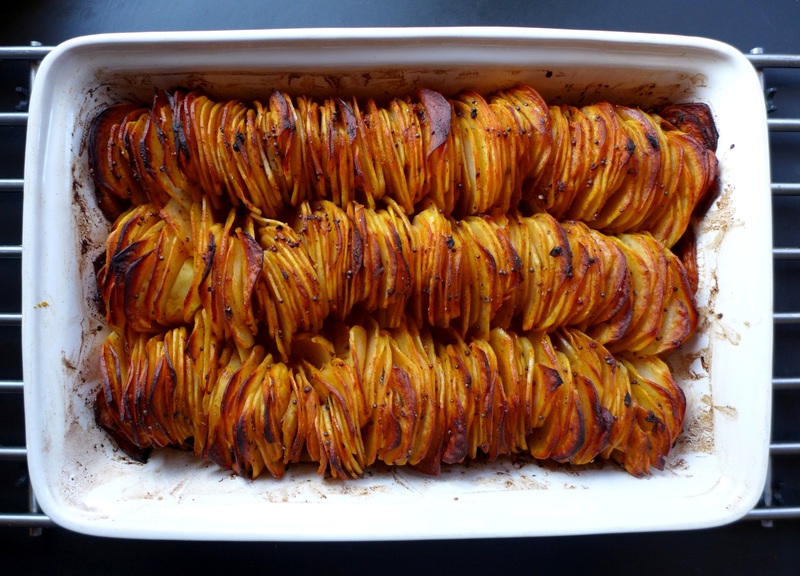 Linda, I’ve done my share of Hasselback and stacked potatoes, but never with your spice profile. I really like your Korean meets curry thing, a must cook. Thanks for sharing. Beautiful. They would really make a leg of lamb sing.